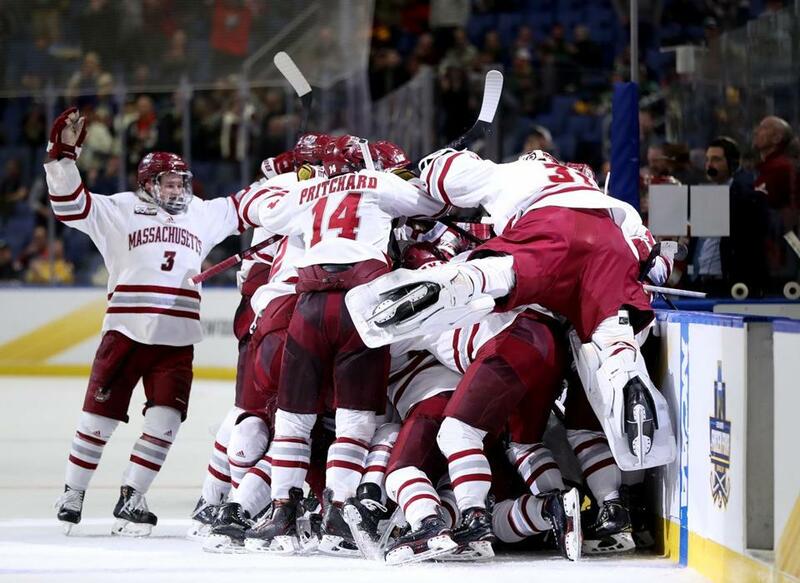 UMass celebrated its overtime win over Denver in the Frozen Four semifinals. BUFFALO – While a 3-0 loss to Minnesota Duluth in the championship game of the Frozen Four at KeyBank Center was not how the UMass men’s hockey team wanted to end its season, it will not overshadow what the team accomplished this season. The awards and records were many, from sophomore defenseman Cale Makar winning the Hobey Baker Award, to coach Greg Carvel being named the national coach of the year. The team also had several program firsts, which included ascending to the No. 1 ranking in the country, capturing the Hockey East regular season title and reaching the Frozen Four. Its 31 wins shattered the previous season-high of 21, set in 2007. It also demonstrated that fans will support a winning program, with the Mullins Center filled to near capacity as the Minutemen continued to roll. That enthusiasm extended beyond the friendly confines of Amherst. When the team hit the road, it was greeted by boisterous supporters, with the back and forth chants of “UUUU!” and “Masss!” echoing at Matthews Arena, Agganis Arena and Conte Forum in Hockey East battles with Northeastern, Boston University, and Boston College, respectively. 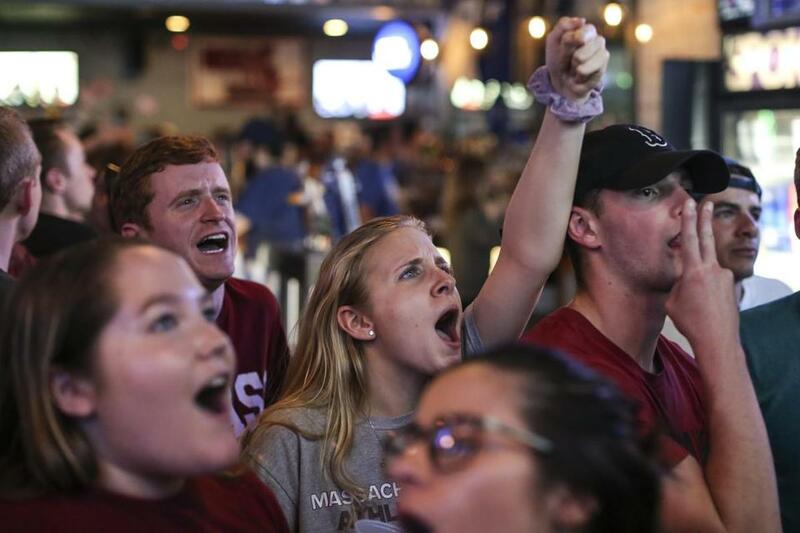 When the team reached the Hockey East semifinals for the first time since 2007, UMass supporters helped drive the attendance at TD Garden to more than 13,000. And the scene in Buffalo this past week was surreal, giving it an Amherst North feel, particularly at Friday’s Hobey Baker ceremony as the Minutemen faithful turned out to see Makar get his just reward. UMass fans made their presence known in the college hockey world during the Minutemen’s historic run. “It’s tough right now. I’m pretty sour,” Makar said after the loss. “But you look back at the two years that I’ve been at this school, especially this year. The amount of respect that we’ve created for this emblem of Massachusetts and UMass, it’s just amazing. But Makar does not figure to be in that future, as he signed an entry-level contract with the Colorado Avalanche on Sunday, who selected him fourth overall in 2017. Seniors Brett Boeing, Kurt Keats and Jacob Pritchard will also be departing the program, but the Minutemen should have a strong nucleus back, provided there are no additional early departures. Sophomore forward John Leonard (16 goals, 24 assists) and sophomore defenseman Mario Ferraro (2 goals, 12 assists) are both San Jose Sharks draft picks and have NHL potential, but could benefit with another year at Amherst. Goalies Matt Murray (20-5-0) and Filip Lindberg (11-4-0) should also return for the Minutemen. “I’m proud of what we’re doing for the university,” said Carvel. “It’s a big state school. To be able to work up the energy and the support that we have on campus, in town. When I got to UMass, it was definitely missing. Last year, the NHL came calling for NCAA head coaches, with David Quinn leaving Boston University and Jim Montgomery stepping down from Denver to take over the New York Rangers and Dallas Stars, respectively. Carvel may not be in the mix this offseason, but given his NHL experience (he spent 12 seasons, 1999 through 2011, with the Anaheim Ducks and Ottawa Senators, including the last eight as an assistant coach with both organizations), he would certainly be on their radar. Meehan has been down this road before: Back in 2013, when he was chancellor at UMass Lowell, Norm Bazin won Coach of the Year honors and led the River Hawks to the Frozen Four in 2013. Makar was quick to credit Carvel for UMass’s success this season, and in the future. “The culture that we’ve instilled in all these guys, the coaches that have put it on us, everybody has just bought in,” said Makar. “That’s one of the main reasons we’ve been such a success this year, why this team will be such a success in the years to come.